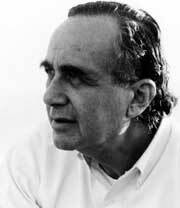 Marvin Harris (August 18, 1927 – October 25, 2001) was an American anthropologist, famous for his contribution to theories of cultural evolution. His approach, called "cultural materialism," combined aspects of Marxism and other anthropological theories, suggesting that patterns of cultural behavior developed based on essential needs. He was often combative in defending his ideas, generating controversy through his use of provocative examples to illustrate his theories. Although his model of how cultures developed was incomplete at best, regarding the external (physical) aspects as dominant over the internal (mental and spiritual) components of human life, he successfully encouraged and trained numerous students in the field of anthropology, and generated public interest in such work. Marvin Harris was born in Brooklyn, New York, into a poor family of Russian-Jewish origin. His father was a salesman who tried to interest his son in business. After graduating from Erasmus High School, Harris received his B.A. in anthropology in 1948. He enrolled into Columbia University, where he earned his Ph.D. in 1953. He stayed at Columbia from 1952 to 1980, teaching and serving as chairman of the anthropology department. He was an associate professor of anthropology there from 1959 to 1963, and professor from 1963 to 1980. Harris carried out fieldwork in Mozambique in 1956-1957, writing about the conditions of living under Portuguese rule. He conducted another field study in Brazil, focusing on race relations. He married his high school sweetheart. Tragedy struck his family when his son died in a car accident in the early 1970s. In 1968, Harris was involved in the infamous, anti-Vietnam War student riots at Columbia, where the New York City police had to intervene. Harris was on the side of pro-student faculty, and wrote about those events in an article published in The Nation. Harris published two books in the 1970s for which he became world famous: Cows, Pigs, Wars and Witches in 1974, and Cannibals and Kings in 1978. Harris used a popular writing style, and so his books were well received by the general public. Harris transferred to the University of Florida in 1980, as the Anthropology Graduate Research Professor Emeritus. He also served as the Chair of the General Anthropology Division of the American Anthropological Association. Harris continued to teach and publish, authoring a total of 17 books. He died in Gainesville, Florida at the age of 74. Harris developed an approach to cultural development, which he called "cultural materialism." He drew largely on the theories of Thomas Malthus and Karl Marx, combining Malthus' focus on the influence of population growth on the formation of social institutions, and Marx's focus on the means of production regarding the same. From an anthropological perspective, Harris combined the comparative method of Lewis Henry Morgan, and the cultural ecology of Julian Steward. In his 1969 book, The Rise of Anthropological Theory, Harris explained his idea of cultural materialism. He argued that cultures, with their diverse cultural patterns, developed according to necessity for survival. Thus, for example, in the Hindu culture, one of the central points of worship is the cow. Harris explained that there is nothing mystical or spiritual in that—people in India needed cows for milk and cultivation, needs that were essential for their survival. "Westerners think that Indians would rather starve than eat their cows," he told Psychology Today. "What they don't understand is that they will starve if they do eat their cows." In his understanding, raising the cow to the status of a deity thus developed due to a purely economic need. A core dimension of Harris’ paradigm is the division of societies into three levels: infrastructure, structure, and superstructure. The infrastructure consists of modes of production and reproduction, essential for the economic survival of the society. The structure is made of domestic and political economy, that is, organized patterns of social behavior such as family system, gender roles, educational system, and organized leisure activities (sport, games, etc.). Finally, superstructure incorporates the aesthetic component of society, including art, rituals, science, ideologies, religion, etc. Into this tripartite system, Harris additionally incorporated the "emic-etic" and "behavioral-mental" dimensions. Emic describes behavior in terms meaningful (consciously or unconsciously) to the actor. Etic, on the other hand, is a description of a behavior in terms familiar to the observer. Behavior, according to Harris, precedes mental, in the same way that etic is privileged over emic. The basic dynamic in the system is that infrastructure, with its subsystems of production and reproduction, influences and dominates other systems. According to this model, if similar technologies are applied to similar environments similar economic, social, and cultural systems should be created. In the second half of his career, Harris shifted from a functional toward a rational explanation of cultural development. He still used materialism as the base of his paradigm, but he drifted from seeing cultural patterns emerging and developing due to the needs of society, toward seeing them in terms of their adaptive value for individuals. Due to his belief that the material needs, both of society as a group and of individuals, precede the formation of the sociocultural systems of that society, Harris was often regarded as a "vulgar materialist." His critics commented that he foolishly tried to explain complex cultural phenomena in terms of a simple mechanical theory. Postmodern anthropologists generally came to regard each culture as separate in its historical development, claiming that each is unique and has to be studied on its own terms, with the result that any search for general laws of cultural development becomes useless. Harris objected to this, claiming that universals can be seen in every culture. He pointed out that anthropology can become a true social science, modeled after natural sciences. With this idea, Harris joined the rebellion against Boasian thought initiated by Leslie White and George Peter Murdock. Besides being labeled as an extreme materialist, Harris was often regarded as scholar who used provocative ideas to prove his points. For example, he substantiated his theory that cultural patterns often arose due to a particular need by proposing that Aztecs were cannibals because of their need for protein (Cannibals and Kings), an idea that drew strong opposition. Harris' research spanned issues of race, evolution, and culture, often focused on Latin America and Brazil. His provocative ideas and controversial presentation style draw attention from both students and fellow scholars. As a teacher, his courses were always popular, and students enjoyed the stimulation of his critical style and vigorous debates. His obituary by Maxine Margolis and Conrad Phillip Kottak (2004), published in American Anthropologist, noted that Harris was "a major force in training students in the science of anthropology." Harris became one of the most influential experts in the area of cultural anthropology, creating a paradigm (cultural materialism) that has continued to be widely discussed and cited in academic circles into the twenty-first century. Harris was one of those researchers who were able to convey their experiences and interpretations to a lay audience. His 17 publications brought his ideas to the attention of the general readership, adding to public interest in the results of anthropological inquiry. Harris, Marvin. 1958. "Portugal's African Wards: A first-hand report on labor and education in Mozambique" in Africa Today Pamphlets, 2. Harris, Marvin. 1966. The Cultural Ecology of India's Sacred Cattle. Columbia University Press. Harris, Marvin, Headland, Thomas N. & Kenneth Pike. 1990. Emics and Etics : The Insider/Outsider Debate. Sage Publications. This page was last modified on 28 August 2018, at 15:02.